Irregular periods can be experienced by many women, and become increasingly likely as she approaches her menopausal years. This can prove to be a difficult condition, sometimes causing embarrassment when you are caught unprepared. For women who struggle to cope with irregular periods, it is possible for your doctor to prescribe medicinal treatment to improve this. Read on to discover more about the most commonly prescribed. This is frequently prescribed for the treatment of the majority of menopausal symptoms, because it works to reinstate the balance of reproductive hormones; the primary cause of problems at this time. 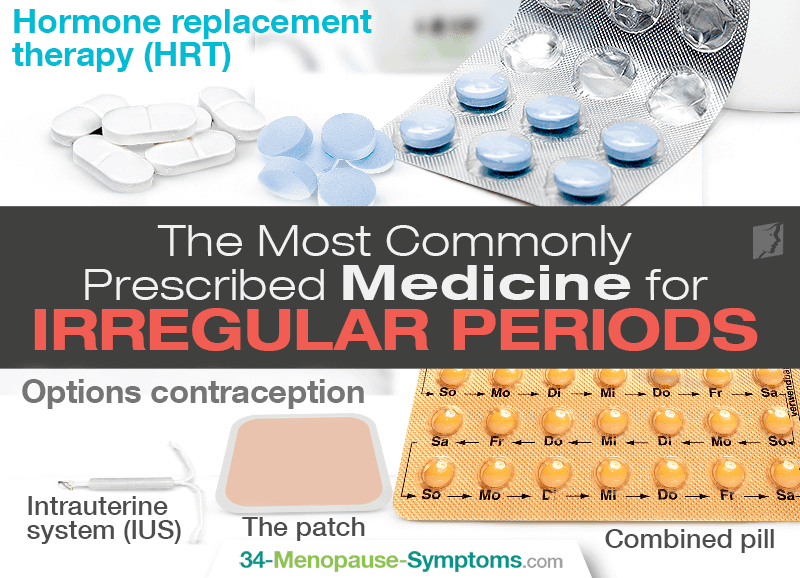 It can come in various forms, but three-monthly cyclical HRT is usually recommended specifically for irregular periods medicine. This involves the daily intake of estrogen and progesterone for 14 days out of every three months. HRT can have some serious side effects in some women, such as an increased risk of breast cancer and blood clots. For this reason, it is important to thoroughly discuss the option with your doctor before embarking on a course. Combined pill. This contains both estrogen and progesterone, and is taken orally for 21 out of every 28 days. It helps to regulate your period which will come on the seven remaining days. The patch. This too involves estrogen and progesterone, but the hormones enter the body via a patch that is applied to the buttocks, outer bicep, abdomen or upper torso. You can choose to avoid periods altogether by wearing it constantly, or otherwise it can be removed for a week, thereby controlling when your period comes. Intrauterine system (IUS). This is a small, flexible apparatus which is inserted into the womb, and releases the hormone progestogen (i, e; a synthetic form of progesterone) in order to control ovulation. It also causes the regulation of periods, which will often become lighter and shorter too. Some forms of contraception can have health risks, including a higher risk of breast cancer and blood clots. As with HRT, it is therefore advisable to talk to a doctor about the different types, and together try to find a suitable type for you. These are just some of the common options for medicine to regulate periods. Their efficacy will largely depend on individual receptiveness, some will be more successful than others in certain women. There are many natural options out there for irregular periods; however, it might be necessary to try a few different options before you find an appropriate sort. Women approaching menopause often experience irregular periods. Click here to learn about natural ways to handle irregular periods.